a deformation of space-time around a massive object. Einstein was the master of the thought experiment, but when it came to real experimentation, not so much. He preferred to make predictions and let the rest of the scientific community scramble to prove or disprove it. Most of the time he was right. But even Einstein was able to admit that “No amount of experimentation can ever prove me right; a single experiment can prove me wrong.” This is an essential characteristic of a scientific theory or hypothesis and is known as falsifiability. Falsifieability is a good thing because it means that a hypothesis is testable and thus conforms to the standards of the scientific method. 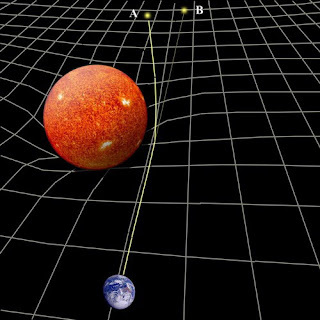 One such case where Einstein’s ideas were put to the test was his General Theory of Relativity, which predicted that in the presence of a gravitational body such as the sun, spacetime would be warped and that light would follow a curved path as a result. Einstein said that light travels along the curve of space-time taking the shortest path between two points, so therefore light is deflected toward a massive object. The stronger the gravitational pull, the more the light path is bent. This idea was received with much scepticism at the time and was in contradiction with Newton’s theories, so scientists were eager to test it. May 29, 1919, confirming Einstein's theory that light "bends". 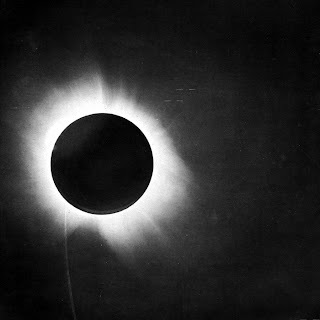 For the British astrophysicist Sir Arthur Eddington, that opportunity came during a total solar eclipse on May 29, 1919. Eddington set out to measure the positions of stars near the sun before and after this eclipse to see if starlight was actually being deflected. Eddington had measured the true position of the stars months before and was able to calculate, according to Einstein’s theory, that there should be an ever-so-slight bending of starlight—now known as gravitational lensing. Eddington’s experiment ended up confirming Einstein’s theory, and by November the London Times ran the headline “Revolution in Science: New Theory of the Universe: Newton’s Ideas Overthrown”. Einstein was an international celebrity overnight. When asked what he would have done had the eclipse experiment not agreed with relativity, Einstein replied “Then I would feel sorry for the good Lord. The theory is correct!”.